Hoover Dam, originally known as Boulder Dam from 1933 to 1947, when it was officially renamed Hoover Dam by a joint resolution of Congress, is a concrete arch-gravity dam in the Black Canyon of the Colorado River, on the border between the U.S. states of Nevada and Arizona. It was constructed between 1931 and 1936 during the Great Depression and was dedicated on September 30, 1935, by President Franklin D. Roosevelt. Astrogeographic position of Hoover Dam for morphogenetic field level 3 which describes the function, atmosphere and energetical topics of the building and how it is embedded in the landsacpe: the coordinates for the astrogeographical longitude stretch in the first degrees of self-protective, emotional water sign Cancer the sign of lakes, sea-shells, shorelines, beaches, fertility, pregnancy, motherhood, the moon and uterus. The area to the east of the dam with the gorge of Lake Mead lies in water sign Cancer whereas the grounds to the west where the dam stands out in the open air lies in air sign Gemini. 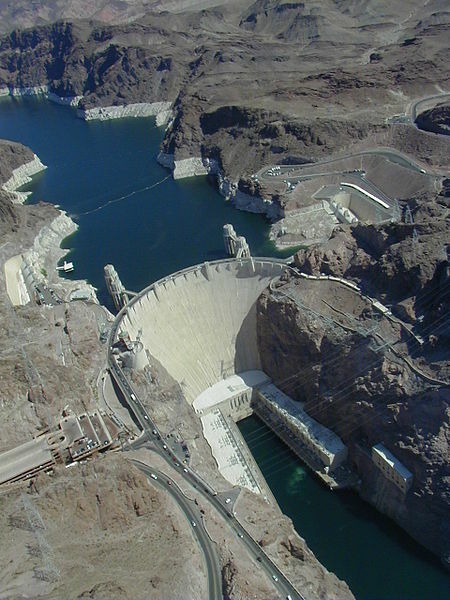 The shell like shape of the dam can interpreted as an analogy of water sign Cancer. The association that the sheltering aspect of Cancer appears to be dedicated at the stabilization of the home of liquids (the lake) really fascinates me. There is also the idea that the semi-circled shape of the dam resonates with the image of the crescent moon – an important analogy of water sign Cancer. The astrogeographical latitude coordinates stretch between the last 2 degrees of practical, functionalistic water sign Gemini the sign of technology, pathways, roads, bridges and connecting opposites and the first degree of water sign Cancer. The sea-shell like shape is symptomatic of buildings in Cancer. Compare my article: Cancer as the Sign of Seashells in architecture. Astrogeographic position for morphogenetic field level 1 which describes the supraregional, nationwide and international resonance of Hoover Dam: the dam is located on 5° in water sign Scorpio and 4° in fire sign Aries. The inauguration of the Boulder Dam (later Hoover Dam) is a good example of what might be possible during the coming transit of Uranus through earth sign Taurus between 15 May 2018 and 7 Juli 2025. In the coming period the exploitation of natural ressources and food production have to be brought to a different level in quality and technology than the ones applied during Uranus` last transit in Taurus between 6 Juni 1934 and 7 August 1941. The desalienation of seawater may turn out the only remaining option for California. This is the chart calculated for 12:00 noon. 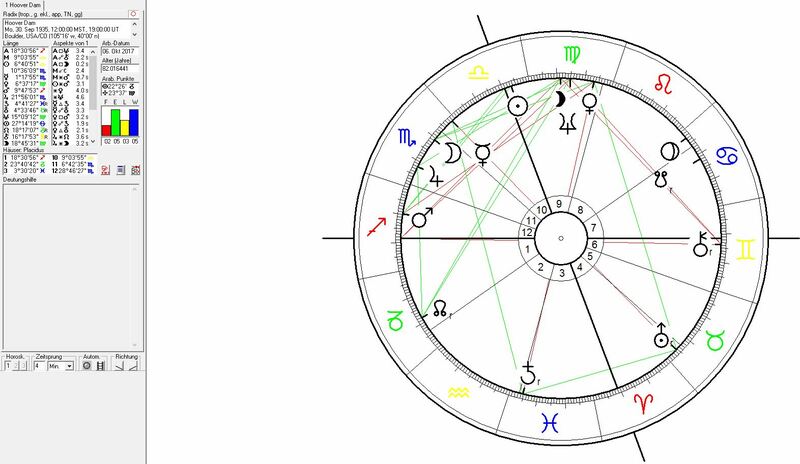 Astrological Chart for the inauguration of Boulder Dam (Hoover Dam) calculated for 12:00 noon due to the lack of exact time data. On the day of the inauguration of Hoover Dam and the fast moving Moon transited the 5°Scorpio astrogeographical position of the dam shortly after midnight. But of even much higher importance is the transit of slow-moving Uranus at 4° Taurus the sign of agriculture over the opposite position to Hoover Dam marking the importance of Hoover dam for the economical growth, occupation of land and food production in the land below the dam. As the ruling planet of Aquarius the sign of the water bearer Uranus stood for the topics of water supply. And of course Uranus was the indicator for innovations, inventions and dicovering new dimensions of possibilities. Uranus` opposition to the site of the dam stands for the impact of the artificial, man made changes brought about by Hoover Dam at the site at Boulder Canyon in the first place. But at the same time it also relates to the changes the dam caused for the Lake Mead area, the State of Califonia and the Colorado River Delta. The Colorado River Delta is located on the divide between Pisces and Aries and the 2nd coordinate in Aquarius (FL1). Water sign Pisces the sign of dissolution and the instability of land is a highly symptomatic resonance for delta areas. Compare: Shanghai (Yangtze delta) in Pisces with Aquarius, Alexandria (Nile) in Aquarius/Pisces, Rotterdam (Rhine) in Pisces with Scorpio.